NEW - Kalev's Interview for the series "Kogu Me Lugu"
"This interview was recorded in the Tallinn Occupations Museum in September 2014. This clip is one of many that the Occupations Museum intends to use in schools throughout Estonia to give the school children a personalized sense of what transpired during and after WWII to Estonian families. That is, what happened to 3 groups of people: those that were able to flee the onslaught of the second Soviet occupation, those that were sent to Siberia once the Russians occupied the country and those that remained behind and suffered the repression in Estonia like my mother and sister." View other inteviews from the series with English and Estonian subtitles on this Kogu Me Lugu YouTube playlist. The author and his sister finally reunited in July, 1982 after WW II tore them apart in September, 1944. In the background is the house the family lived in during the Soviet occupation and the subsequent German invasion. The German troop carrier that the author and his father managed to board as the Red Army approached Tallinn, the Estonian Capital, on September 19th, 1944. A picture of the aftermath of the Royal Air Force Ulm (Germany) bombing raid on the night of December 17th, 1944. Father and son miraculously escaped death as bombs were exploding all around them. Charles (Kalev) Ehin is an accomplished author and recognized management and innovation dynamics authority. He is currently an Emeritus Professor of Management at Westminster College in Salt Lake City, Utah where he also served as the Dean of the Gore School of Business. 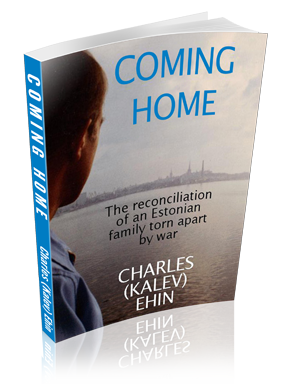 Beginning with author’s return to his birth place, Tallinn Estonia, in 1982 to be reunited with his sister and other accessible family members not seen for 38 years, he chronicles not only the bloody results of the back-and-forth War as it battered Eastern Europe, but also day-to-day life of soul-smothering bureaucracy, tyrannical policies and burning prejudice that survived the war. The story is told in the first-person in a way that brings the reader right into Eastern Europe, to the moment at hand with its troubled history. Choice pictures make the narrative even more vivid and compelling. It’s an exceptional, personal, historical account with remarkable applicability to contemporary—and most likely—future global events. This full length documentary by Matt Sampson follows Kalev's return to Estonia for the 2009 Estonian Song Festival. It has just recently been completed and made available online. Click here to view on YouTube or launch the video at full screen size.